Use the Options Tab on the Object Editor dialog box to set miscellaneous appearance and performance options for an object. Set miscellaneous appearance and performance options using the Options Tab of the Object Editor dialog box. 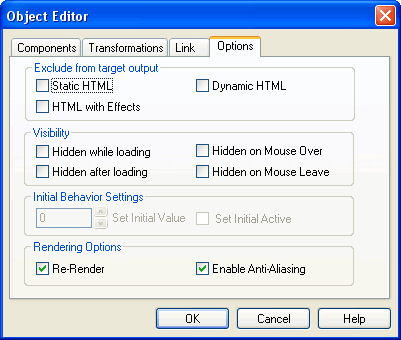 Exclude from target output Static HTML Click to checkmark to exclude the selected object from being published when HTML with Effects mode is used for publishing. HTML with Effects Click to checkmark to exclude the selected object from being published when Static HTML mode is user for publishing. Dynamic HTML Click to checkmark to exclude the selected object from being published in Dynamic HTML (DHTML). SVG Click to checkmark to exclude the selected object from being published in SVG mode. Static HTML, HTML with Effects and Dynamic HTML are HTML code generation modes. The specific mode used in a particular case is determined by the contents of a page. For example, if Mouseover FX are used, HTML with Effects code will be generated. These modes are chosen automatically and should not be a concern. They are provided here merely as categories for greater control when excluding objects. To exclude an object whenever any HTML mode is used, check all 3 HTML options. Visibility Hidden while loading Click to checkmark to make the selected object invisible until the published page is finished loading in the browser window. Hidden after loading Click to checkmark to make the selected object invisible after the published page is finished loading in the browser window. Hidden on Mouse Over Click to checkmark to make the selected object invisible when the user moves the mouse pointer to the object. Hidden on Mouse Leave Click to checkmark to make the selected object invisible when the user moves the mouse pointer away from the object. Initial Behavior Settings Not available in SiteSpinner® Pro. Rendering Options Re-Render Click to checkmark to have SiteSpinner® Pro redraw the image at its current resolution after applying any scaling, skew, or rotation operations. Click to un-checkmark to maintain the image in its original format. For more information, see Rendering and Re-Rendering. Enable Anti-Aliasing Click to checkmark to smooth the jagged edges of vector geometry, title objects, and rotated images that are to be published in HTML format. SVG will usually perform its own anti-aliasing.